The Domain Archaea wasn't recognized as a major domain of life until quite recently. Until the 20th century, most biologists considered all living things to be classifiable as either a plant or an animal. But in the 1950s and 1960s, most biologists came to the realization that this system failed to accomodate the fungi, protists, and bacteria. By the 1970s, a system of Five Kingdoms had come to be accepted as the model by which all living things could be classified. At a more fundamental level, a distinction was made between the prokaryotic bacteria and the four eukaryotic kingdoms (plants, animals, fungi, & protists). The distinction recognizes the common traits that eukaryotic organisms share, such as nuclei, cytoskeletons, and internal membranes. The scientific community was understandably shocked in the late 1970s by the discovery of an entirely new group of organisms -- the Archaea. Dr. Carl Woese and his colleagues at the University of Illinois were studying relationships among the prokaryotes using DNA sequences, and found that there were two distinctly different groups. Those "bacteria" that lived at high temperatures or produced methane clustered together as a group well away from the usual bacteria and the eukaryotes. Because of this vast difference in genetic makeup, Woese proposed that life be divided into three domains: Eukaryota, Eubacteria, and Archaebacteria. He later decided that the term Archaebacteria was a misnomer, and shortened it to Archaea. The three domains are shown in the illustration above at right, which illustrates also that each group is very different from the others. Further work has revealed additional surprises, which you can read about on the other pages of this exhibit. It is true that most archaeans don't look that different from bacteria under the microscope, and that the extreme conditions under which many species live has made them difficult to culture, so their unique place among living organisms long went unrecognized. However, biochemically and genetically, they are as different from bacteria as you are. Although many books and articles still refer to them as "Archaebacteria", that term has been abandoned because they aren't bacteria -- they're Archaea. Finding Archaea : The hot springs of Yellowstone National Park, USA, were among the first places Archaea were discovered. At left is Octopus Spring, and at right is Obsidian Pool. Each pool has slightly different mineral content, temperature, salinity, etc., so different pools may contain different communities of archaeans and other microbes. The biologists pictured above are immersing microscope slides in the boiling pool onto which some archaeans might be captured for study. Archaeans include inhabitants of some of the most extreme environments on the planet. Some live near rift vents in the deep sea at temperatures well over 100 degrees Centigrade. 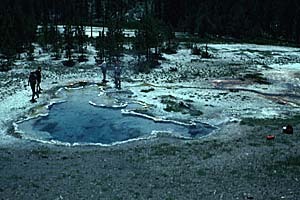 Others live in hot springs (such as the ones pictured above), or in extremely alkaline or acid waters. They have been found thriving inside the digestive tracts of cows, termites, and marine life where they produce methane. They live in the anoxic muds of marshes and at the bottom of the ocean, and even thrive in petroleum deposits deep underground. Some archaeans can survive the dessicating effects of extremely saline waters. One salt-loving group of archaea includes Halobacterium, a well-studied archaean. The light-sensitive pigment bacteriorhodopsin gives Halobacterium its color and provides it with chemical energy. Bacteriorhodopsin has a lovely purple color and it pumps protons to the outside of the membrane. When these protons flow back, they are used in the synthesis of ATP, which is the energy source of the cell. This protein is chemically very similar to the light-detecting pigment rhodopsin, found in the vertebrate retina. Archaeans may be the only organisms that can live in extreme habitats such as thermal vents or hypersaline water. They may be extremely abundant in environments that are hostile to all other life forms. However, archaeans are not restricted to extreme environments; new research is showing that archaeans are also quite abundant in the plankton of the open sea. Much is still to be learned about these microbes, but it is clear that the Archaea is a remarkably diverse and successful clade of organisms. Click on the four buttons below to learn more about the Archaea. 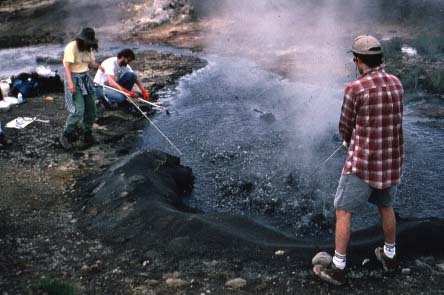 An impressive set of links to all things Archaean may be found at Life in Extreme Environments: Archaea on the Astrobiology Web. Get a general introduction to the major groups of prokaryotes from Kenneth Todar at the University of Wisconsin--Madison. The Microbe Zoo features several methane-producing organisms, including some Archaea. For more information on Halobacteria, including lesson information for teachers, go to The HaloEd Project. Images of Yellowstone springs courtesy of Norman Pace at the University of Colorado, Boulder. T. D. Brock, M. T. Madigan, J. M. Martinko, & J. Parker. 1994. Biology of Microorganisms, 7th ed. (New Jersey: Prentice Hall). W. Ford Doolittle. 1992. What are the archaebacteria and why are they important? Biochemical Society Symposium 58: 1-6. G. E. Fox, L. J. Magrum, W. E. Balch, R. S. Wolfe, & C. R. Woese, 1977. Classification of methanogenic bacteria by 16S ribosomal RNA characterization. Proc. Natl. Acad. Sci. USA 74: 4537-4541. K. Horikoshi & W. D. Grant (eds.). 1998. Extremophiles -- Microbial Life in Extreme Environments (New York: Plenum). John L. Howland. 2000. The Surprising Archaea (New York & Oxford: Oxford University Press). M. T. Madigan & B. L. Marrs, 1997. Extremophiles. Scientific American (Apr): 82-87. C. R. Woese, 1981. Archaebacteria. Scientific American (Jun): 98-122. C. R. Woese & G. E. Fox, 1977. Phylogenetic structure of the prokaryotic domain: The primary kingdoms. Proc. Natl. Acad. Sci. USA 74: 5088-5090.